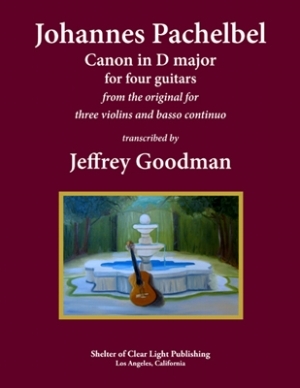 This is a transcription for four guitars of Johannes Pachelbel’s Canon in D major, originally written for three violins and basso continuo. This edition is designed for concert performance as well as for classroom instruction. The score ispresented with amply notated guitar fingerings for each of the four parts. Also included are separate parts for each of the guitars. Pachelbel’s Canon utilizes the form of a three part canon and an accompanying ground bass. The term “canon” referis to a contrapuntal device in which several voices play the same melodic line, entering one by one in sequence. In Pachelbel’s piece, there are three voices playing in canonic imitation, above a repeating fourth voice, the basso continuo, which plays an repeating bass line melody.